Tuesday, July 31, 2018 9:00 AM by Downtown Huntsville, Inc. 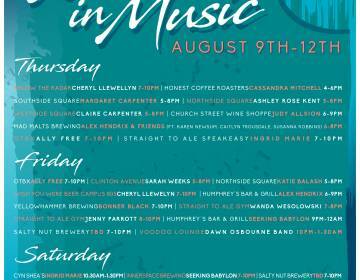 The Downtown Huntsville Women in Music Weekend debuts this August 9th – 12th in the city center. This event will feature over 25 female musicians performing at over 15+ downtown venues over the course of 4 music-filled days. As the largest “Women in Music Weekend” in Alabama, Huntsville will be showcasing some of its best talent. “We&apos;re thrilled to have so many amazing female musicians and music venues in Downtown Huntsville. This event brings them both together in a unique and accessible way” states Chad Emerson, President & CEO of Downtown Huntsville, Inc.
Thursday, Friday, Saturday, and Sunday (August 9th – 12th) during various times, you will be able to visit one of the local venues, listen to wonderful free concerts, help support women in music, and enjoy an evening out! For more information about the musicians, schedule, and venues please visit Downtown Huntsville, Inc’s Facebook Page for the Downtown Huntsville Women in Music Weekend event.